That’s just a useful effect. I’m still an instrument of death. Jessica is a reaper who was assigned to reap, unbeknownst to her, Dean Winchester at Dr. Avery Meadows' Mental Health Center. She later gets assigned "baby monitor" duties watching over Sam and Dean Winchester by Death soon after meeting Dean. Soon after Dean kills himself, Jessica arrives to Dr. Avery Meadows' home and introduces herself, telling Dean she is there to take him to his next life. Dean in turn introduces himself and quickly brushes her off to chase down a ghost. Jessica realizes who Dean is and teleports to Death's Reading Room, where she announces that Dean Winchester is in the Veil. After Dean makes a deal with Billie to give her information on the rift, Jessica appears back at the home standing in front of all the ghosts and tells them to come with her and that it will be okay. The ghosts agree and pass on to the next plane of existence. As Sam and Dean discuss not being able to contact Rowena, Jessica materializes in the backseat of the Impala suggesting she has bad cell reception. Jessica's sudden arrival causes Dean to slam on the breaks and pull Baby over. Jessica appears in front of the Impala and reveals that Billie has placed her as a "baby monitor" to watch over Sam and Dean, admitting she has seen everything they have been doing. She tells them of four people in Portland that have died before their time, Sam cuts her off telling her they are handling it. Jessica offers her assistance, telling them she is around if they need her. At the site of one of Rowena's victims, Sam deduces that a reaper was killed due to the black spot near the ashes of the victim. Exiting the museum Dean calls for Jessica who happily appears and tells them Rowena is killing reapers along with her victims, and changing fate which will eventually lead to consequences which will force a mass kill off to fix the butterfly effect that Rowena has caused if she continues. When Dean questions why Jessica just doesn't stop Rowena, she tells him that since Billie has taken over the mantle of Death, she has instituted a no direct interference rule among the reapers and that Sam is only one that can stop her. Questioning what she means, Jessica tells him of Death's notebooks detailing how a person will die based on choices, and that all of Rowena's deaths involve Sam. Sitting in Baby, Sam and Dean discuss the case and surmise Rowena's next victim when Jessica appears in the backseat and confirms that Rowena is going to kill soon. Sam, Dean and Jessica arrive in the aftermath, Jessica noting the reaper that was killed was named Martin to the Winchesters. After meeting with Rowena in a hotel bar, Sam and Dean give chase to her. When Dean is stopped by her bodyguard Bernard, Jessica appears to encourage Dean to hurry up, but telling him she can't help him. When Dean finally renders Bernard unconscious, Jessica tells Dean how impressed she was, but he races off to find Sam, only to find his gun in the alley as Jessica appears soon after. 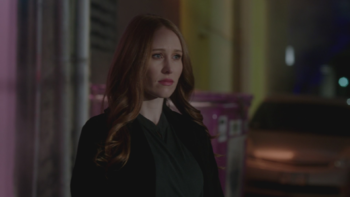 After locating Sam, she and Billie leave after Rowena's threat to the natural order is gone. After being trapped by Michael's Monsters, Sam attempts to call upon Jessica for help, remembering how she told him that Billie has her constantly following the Winchesters around. Instead of Jessica, another reaper, Violet, appears only to Sam. Violet explains that Billie now has her reapers watching over the Winchesters in shifts and it is Violet's shift and not Jessica's at the current time. This page was last edited on 7 March 2019, at 10:41.